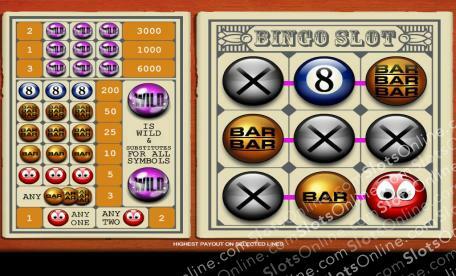 Are you a bingo and a slots fan and are constantly forced to pick between the two? Click here to play! Well, worry no more, because here is a game that combines the two in a fantastic game that will see you winning plenty of cash! As this game plays like a slot, you'll want to watch out for certain symbols, namely the purple WILD ball. This little guy will not only pay out massive dividends (up to 6000 credits if you spin three of them across line four), but it acts as a wild symbol and will replace all other symbols to help you bring in more wins. You'll also want to watch out for the 8 ball. This numbered sphere will bring in up to 200 credits if you can spin three of them across an active pay line. There are also triple, double and single BAR balls. These will bring in 50, 25 or 10 credits respectively. Or, if you can spin any combination of the three across a pay line, you'll get three credits. Finally, there is the red smiley ball. This happy little guy will fetch 5 credits if you spin him across one of the five pay lines. This fantastic game comes in a 3 reel, three payline version as well as a 5 reel, 25 payline version. Try your hand at this bingo/slots hybrid and see if you've got what it takes to bring in the biggest wins! The Wild ball will substitute for all other symbols. It will also bring in up to 6000 credits if you can spin it across line 4. 4000 credits if you can spin three across line 5. 3000 credits if you can spin it across line 3. 2000 credits if you can spin it across line 2, and 1000 credits if you can spin it across line 1.